Kehilat Bnei Torah in Har Nof holds largest Avot Ubanim ever, commemorating the 5 martyrs murdered in attack. Last Saturday night, Motzei Shabbat Parshat Chayei Sarah, the Bnei Torah congregation in Har Nof held an inspiring Avot Ubanim learning night in memory of the five martyrs who were killed in the vicious terror attack at the synagogue four years ago. Some 1,000 children gathered with their fathers at the very site of the massacre to learn Torah with fervor, in an atmosphere of togetherness and unity, for the sake of those victims. 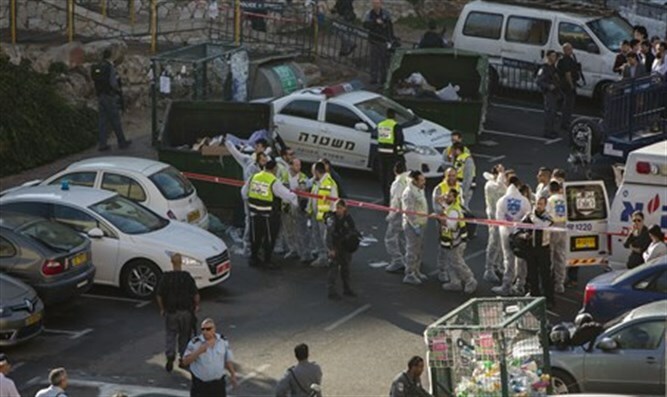 Grief, mourning and a black mood pervaded the Har Nof community in the period following the tragedy, in which five community members were killed at the start of a seemingly ordinary day during their daily morning prayer in the synagogue, wrapped in their prayer shawls and tefillin. Under the judicious guidance of the congregation's leader, those negative energies have been transformed into positive ones -- by establishing the Ateret Kedoshim Kollel which will serve as a beacon, casting its spiritual light in all directions. Over the past four years the Ateret Kedoshim Kollel has been an opportunity for personal and collective growth, scholarship and Torah learning for the ilui neshama -- literally the elevation of the souls -- of the slain victims. Today, the Kollel functions as a spiritual home for many neighborhood residents, some of whom are full-time Torah learners and others who work for their livelihood but make sure to set aside time for the Torah learning so important to them on a regular basis. They all come to the Kollel and learn Torah together. A variety of programs are available every day of the week, allowing any learner to find one that suits them. Help us keep the flame alive! We need your donation, so that we can continue to run these programs for yet another year.